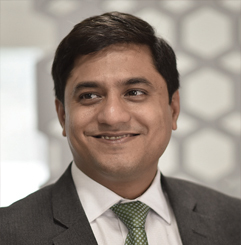 Ritesh has been a member of the Founding Team at the firm. He has led a number of engagements in areas as diverse as market expansion strategy for a Fortune 500 medical equipment manufacturer to the performance transformation of a leading hospital chain in South India. He has received numerous accolades from clients for his rare insights and extraordinary commitment. Ritesh, a graduate in Nautical Sciences and Marine Engineering, previously worked with British Petroleum for five years. He is an MBA from the Indian School of Business. In recognition of his leadership and commitment at ISB, he was one of the 12 recipients of the Young Leader Award amongst a batch of 440 students. In addition to being a contributor to different industry magazines, Ritesh is a frequent speaker at industry forums and healthcare management institutes. Ritesh has attended the Executive Education Program on ‘Leading Innovation’ at Harvard Business School and on ‘Data Analytics in Healthcare’ at IIM, Ahmedabad. He is a member of the evaluation panel for the Global Social Venture Competition Asia- Africa Region, organized by Haas School of Business at UC Berkeley.